The home of Alfred Hosokawa is much like its owner—compact, with a quiet charm and rustic attraction. The house sits modestly overlooking a small piece of garden, yet it hides a treasure trove. Behind the house is Hosokawa’s workshop and entering it is like walking into another time—inside, there is nothing made of plastic, nothing glowing and bleeping. The walls and posts are warm, brown unfinished lumber and the small space is filled with tools of all manner. Some are recognizable—woodworking tools, augers of differing widths, screwdrivers and chisels—while others look like art sculptures; a wooden arm with a stone wired on top of it, for instance. Three instruments gleam among the supplies of raw wood and wooden tools on the shelves, their bodies shining, their shapes inviting touch. 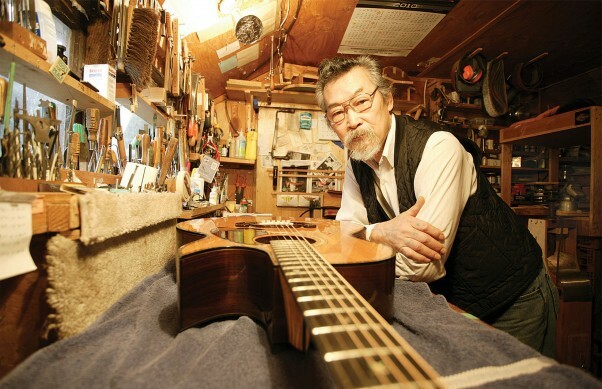 These are some of the treasures wrought by Hosokawa in creating his hand-made guitars. There is now a school in Qualicum—the Summit School of Guitar Building—which has been in existence for about 15 years, that inspiring Luthiers may attend to learn the ancient art of guitar making. The Hosokawa family grew up in Salmon Arm. But the family—although all had been born in Canada and Hosokawa’s grandfather had fought with the Canadian Infantry in the First World War—was forcibly moved from their home by the Canadian Government when all people of Japanese ancestry were forbidden to live on the coast. The government’s rationale was that Japanese-Canadians might assist Japan in an invasion of Canada after Japan dropped bombs on Pearl Harbor during the Second World War, destroying much of the American fleet. It is only within the last 10 years that Japanese people have been compensated for the homes and businesses the government seized at that time. Hosokawa and his parents eventually made their way back to Salmon Arm. “My parents liked it in Salmon Arm and stayed there. I was a child when we were expatriated, so to me it was home,” Hosokawa says simply. Hosokawa smiles and gives a shrug, adding: “When it’s your passion, though, you don’t care. This article is awesome. Make me love guitar even more.